The Infinite Dial Canada looked at the uptake of smart speakers in the country, as well as pointing out some unique trends compared with the southern neighbors. In Canada, smart speaker ownership is 8% of the adult population. People aged 35-54 were most likely to own smart speakers at 11%, followed by ages 18-34 at 10%. 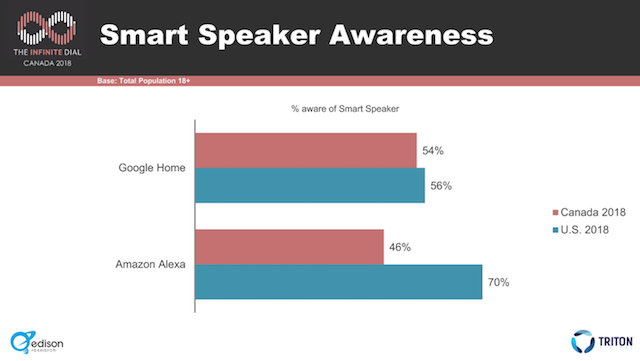 Google Home topped the smart speaker brand awareness with 54%, trailed by Amazon Alexa at 46%. Those results are flipped from the United States version of the survey, where Amazon led with 70% awareness followed by Google at 56%. Google also had a notable boost in the responses to ownership questions. Nearly two-thirds (63%) of smart speaker owners said they had a Google Home but no Amazon Alexa device. Alexa-only households accounted for 30%, and the remaining 7% said they had a device from each brand.